If you plan a tour and before you step out of the door it starts raining heavily, then how would you feel? Very sad, isn’t it? You can avoid such things by knowing the weather conditions beforehand. Yes, you can know how the weather is at a particular place before you step out of the door for a tour. Most of us are using smartphones and there are many apps for iPhone on iTunes. So, it is not a big deal to install and use these apps. There are many weather apps in the store and I listed out the 10 best ios weather apps that you can use without a second thought. RadarScope is an excellent app that provides numbers if features for weather enthusiasts. 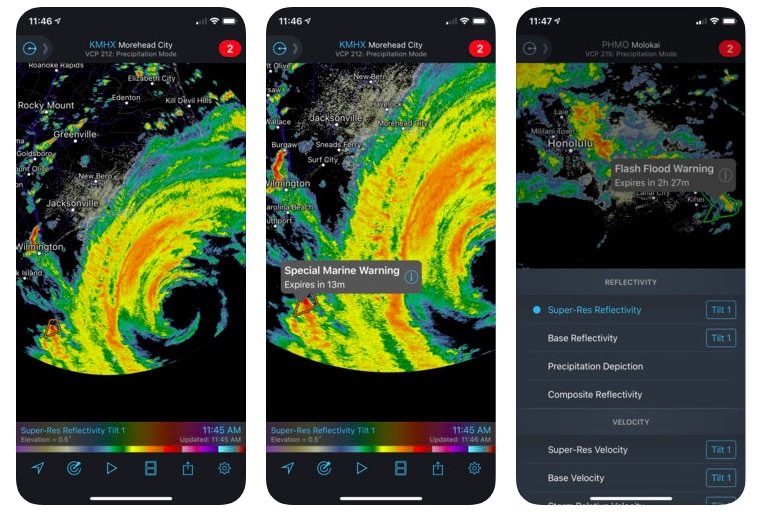 It allows you to view NEXRAD Level 3 and Super-Resolution radar data along with Tornado, Severe Thunderstorm, Flash Flood and Special Marine Warnings. It also shows predicted storm tracks issued by the US National Weather Service along with real-time lightning alerts, extended loops, and more. The app is not free and costs $9.99. If you know about NEXRAD radar and understands it, you know that the app is worth to spend on it. BeWeather 2 is good for those who want customizations with weather watching. The app brings data from a vast network of over 135,000+ worldwide weather stations and Forecast’s hyper-precise minute-to-minute rain predictions. The app gives you access to weather maps with storm and hurricane trackers. It comes with a fully customizable widget and a Watch app. You have 10 color themes, 150 different free weather icons and many fonts to choose from. This is also a paid app and costs $3. Yahoo! 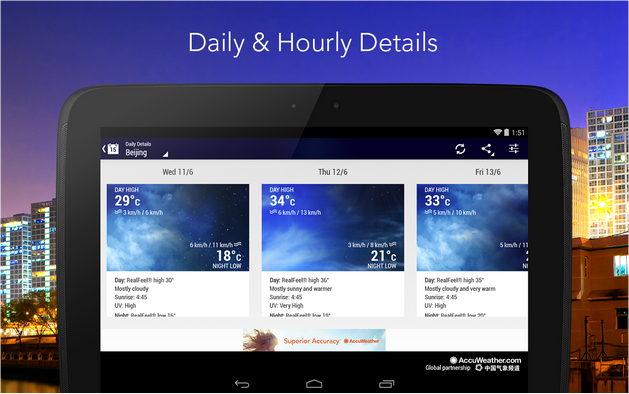 Weather is the app which displays the weather conditions right on the screen of your smart mobile. Due to its accuracy, it is one of the best weather apps for iPhone. Before stepping out of the door, just have a lot of this app and you will get to know whether the day is going to be rainy, cloudy or sunny. Based, on that you can decide whether you want to carry an Umbrella or not. It presents you the weather models which are interactive, details regarding wind and pressure and more information. Apart from this, it allows you to add numbers of cities to know weather conditions of those cities. So, whenever you plan to go somewhere, add that to the city’s list and you will know the weather conditions at that place. 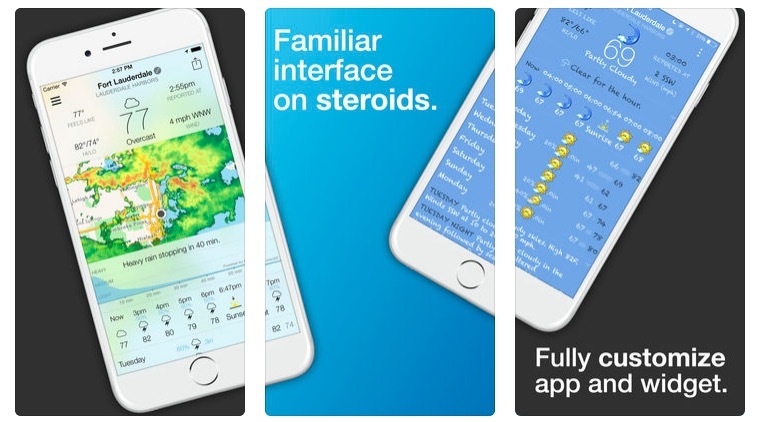 These features make this app, the best ios weather app. 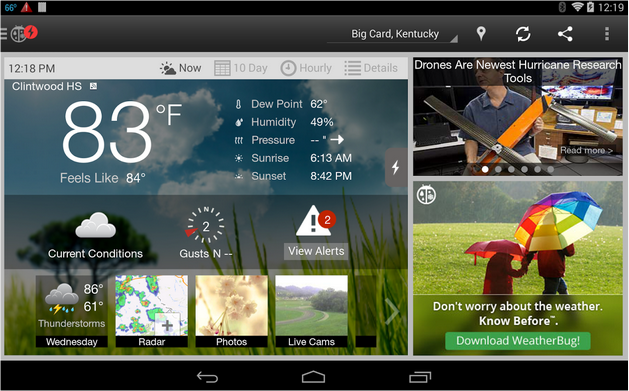 What The Forecast is also a good app that keeps you updated about weather conditions. It uses more than 8206 obnoxious phrases to describe the current weather conditions It also provides daily forecasts for 7 days. You can also listen to the latest meteorological conditions in different voices. It also brings weather alerts from NOAA. Weather HD Free weather app is best known for its visual attraction. Apart from just displaying the weather conditions on the screen, it changes the background of the app accordingly with the weather. 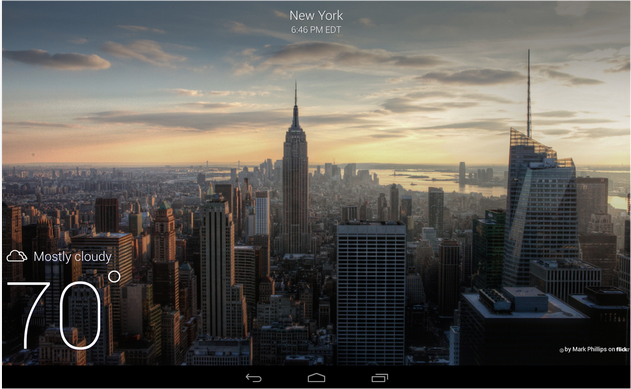 It also allows you to add more cities and stay updated with weather conditions of other cities. You just need to swipe to see how the weather is in different cities. It provides animations on the screen as and when the weather changes. This is one of the best weather apps for Android and iPhone and a suggestible weather app. AccuWeather is best-known weather app as it keeps updating itself for every second. As and when the weather changes, it shows the latest weather conditions on the screen with the feature called MinuteCast and it is very professionally designed. You can add as many cities as you want. 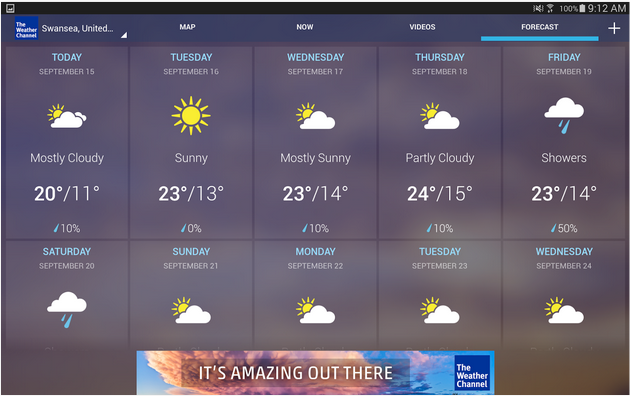 It includes Weather Widget, social sharing and many more. It shows how the weather is going to be for the next week and based on that you can plan your day. It allows users to view in both landscape and portrait view and is said to be one of the best weather apps for Android and iPhone. The Weather Channel weather app gives you something more than other weather apps. Apart from just displaying the weather information on the screen, it alerts you if there are any heavy rainfalls or tornados. It also shows wind speed, snowfall, time of sunrise and sunset and much more information. 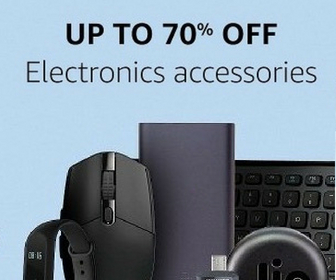 It is available free of cost for both Android and iPhone. WeatherBug weather app, apart from showing the weather information, it acts as a lightning detector. If you want to know if there is any lightning near your place, then it is advisable to use this Weather Bug weather app. It shows you the snaps from cameras of various cities, to know about the weather conditions in live. 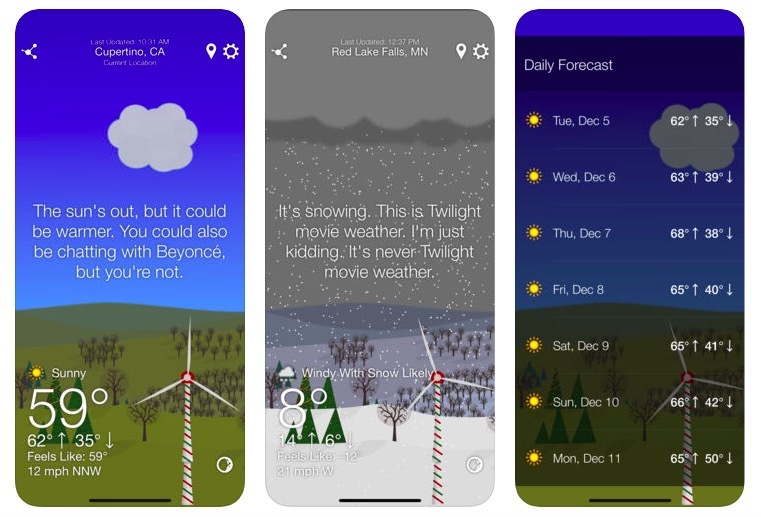 It is one of the best weather apps for Android and iPhone and it is suggestible if you want to keep yourself updated with changing weather conditions. 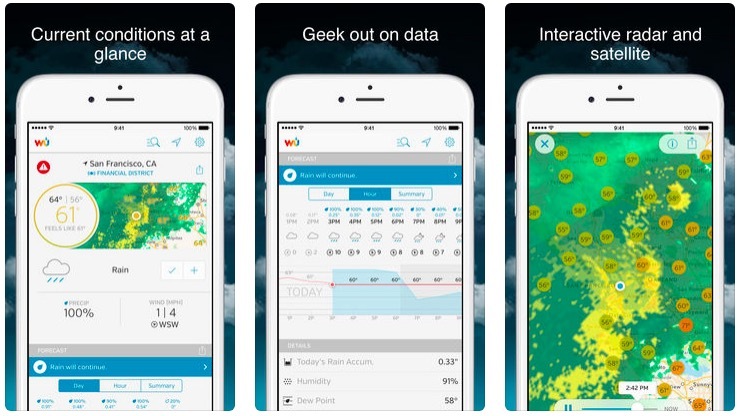 Weather Underground is another impressive weather app you can try on your iPhone. It has more than 200,000 personal weather stations and delivers accurate weather forecasts. It gives you current weather conditions about your local area. The data includes temperature, visibility, wind speed and direction, humidity, etc. It also lets you monitor air quality, UV risk, and even local flu outbreaks. It also shows sunrise and sunset time. 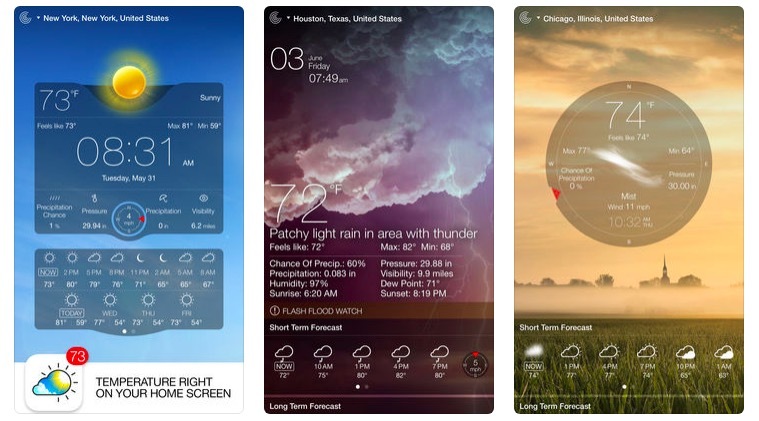 Weather Live is another beautifully designed weather app for iPhone. It shows real-time weather condition and offers detailed data for daily, hourly, and 7-day forecasts. You can also customize the data display option to get exactly what you want to know. You can choose from four different layouts offering simple or complex details. You can also set the order. You also have an option to search the weather data for any location. It also has Animated weather radar to quickly see what weather is coming your way. 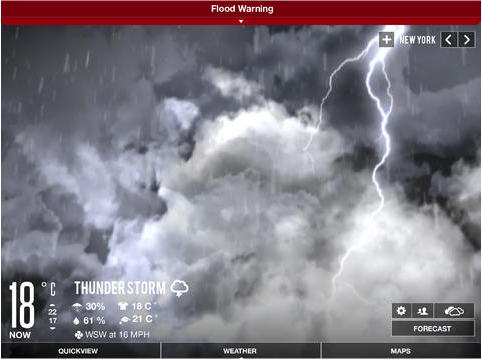 The app also includes Hurricane Tracker, Bad weather warnings, Freeze Alert, and more. The app is paid and costs $2.99. It is always good to know about the weather conditions before planning your day. From now on, before planning something, I advise you to have a look at these best iOS weather apps. If you have anything to add, please, do share with us through comments. Also let us know what is your favourite weather app.